Siam Compressor Industry Co., Ltd.Plant most reliable Japanese compressor Siam Compressor Industry Co., Ltd. — Was founded May 25, 1990 in Thai land (Thailand). 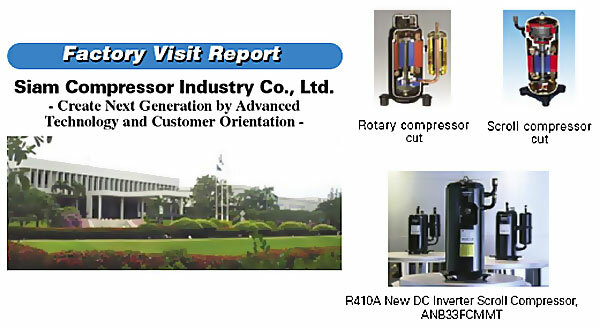 The company not only produces rotary, scroll compressors and Mitsubishi-Electric, which are unsurpassed quality and excellent reputation among enterprises producing coolers.Production capacity can not only provide the plant conditioners Mitsubishi-Electric Consumer Products (Thailand) Co., Ltd., And sell surplus compressors as an independent, finished product. They's the bread loaves of bread and only grow on trees, I began to laugh in a conversation on this maxim, then I was offered the option on the ground, like a palm tree, like a pineapple ... I felt sad. I understand Americans — very smart. Besides the company, Siam Compressor Industry Co., Ltd, compressors for split systems are also made in factories Wakayama Works (scroll compressor for VRF-systems and screw type compressors for chillers), is also Shizuoka Works are: compressors for domestic refrigerating systems and refrigerators.